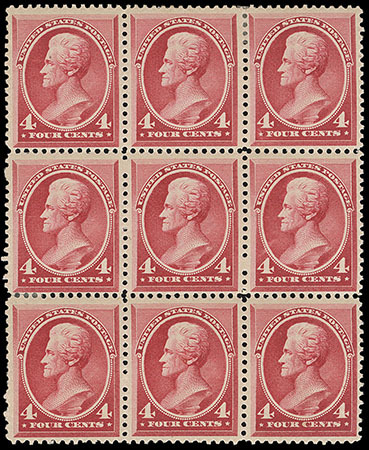 1888, 4¢ carmine, block of 4, o.g., five stamps never hinged, rich radiant color, F.-V.F. 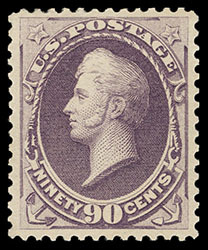 1888, 90¢ purple, o.g., lightly hinged, strong bright color, choice centering within nicely balanced margins, Extremely Fine, choice so nice; with 1998 P.S.E. certificate. 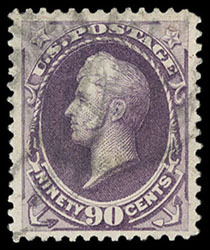 1888, 90¢ purple, o.g., hinge remnant, wide margins, tiny margin tear at left, Very Fine appearance. 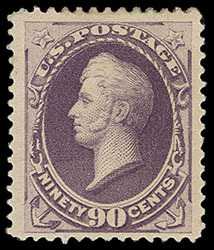 1888, 90¢ purple, light oval cancels, wide margins, rich bright color, Extremely Fine; with 2002 P.S.E. certificate Graded (XF 90, SMQ $650).